Belgian online platform Red Bull Elektropedia have - as part of our 25 years celebrations - commissioned a series of special reworks of some of our notable classics. Red Bull Elektropedia have been a major force in documenting Belgian culture and nightlife since 2009. Their output exudes professionalism and the content is always interesting and accurately detailed. We've worked with them in the past and when they said they wanted to help us celebrate this year, of course we accepted. They have enlisted the talents of some of Belgium's finest contemporary music artists to work their magic, and we couldn't be more happy with the results. 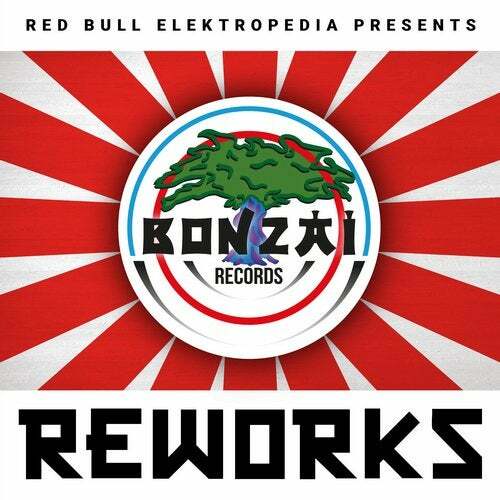 The reworks are available on CD, Digital and Vinyl and if you head over to Red Bull Elektropedia's website you will find excellent mini docus on each artist. On top of that they have also produced an in depth documentary around the Bonzai story. Featuring rare unseen footage of Bonzai studios and the artists that passed through its doors, we also get various testimonies on the good times and tougher times from label founder Christian Fly Pieters and business partner Marnik Braeckevelt as well as contributions from several other key players from the early Bonzai days, artists and fans. The documentary will be aired at special screenings on 14th October 2017 and then general release online shortly after. On CD and Digital platforms we have seven superb tracks that have been transformed into something unique, fun and brilliant. First up on the reworks we have the talented quintet that make up the outfit Stuff, and their interpretation of Cybertrance and The House Of House. Since their debut album in 2015, this band of musical brothers have used their eccentric methods to take on several genres to come up with something quite unique. Familiar with the early Bonzai sound, the guys have captured the raw essence of rave in a contemporary fashion resulting in a sublime mash-up. The track intros with a toy piano style Cybertrance melody with pitched down vocal alongside a pacey kick drum. The live instruments really add a lot of warmth and work perfectly with the synths. The magic on this one is the blend between the two iconic tracks, it creates a raucous atmosphere that will bring memories flooding back. Charlotte de Witte gets to grips with The First Rebirth and man oh man what track it is. With a solid rep as a Techno DJ, Charlotte is a perfect candidate for this one thanks to her hands on approach to production which has resulted in several floor killers. Here she takes the ultimate Bonzai classic from a dizzying 160BPM to a nice and groovy 130BPM while bridging the gap between past and present. The track intros with a warming glow as lush kick drums lead the way followed by that infectious melody which fades in slowly. Bubbling underneath the track you'll find a wonderfully warm bassline that lures you in, locking you into the groove. On the break the melodies dominate and hypnotise before Charlotte unleashes those pitching synths in a huge climax, slamming us back into full on mode. A definite must have that will keep the serious Techno floors moving. Antwerp based producer Roman Hiele takes on another Jones & Stephenson cut, this time it's a track that ended a successful run of releases for the Belgian duo - The Last Rebirth. Roman has a deep interest in experimentation and he rose to prominence after appearing at the Red Bull Music Academy in 2015. He has certainly dug deep on this one, stripping away almost all remnants of the original to leave us with a trippy space age construction that will leave its mark on your brain. Strange and eerie sounds provide the intro before a severe pitched down chord pad from the original takes over. You can just about hear the melody as it tries to force its way through the melancholy and all the while the pitching down continues, locking you in with its hypnotizing allure. Simply outstanding, great vision and expert craftsmanship in sound design. Worldwide touring DJ and producer Lefto is up next and here he takes on another seminal classic in the mighty Bonzai Channel One. Pumping kick drums introduce us to this one before huge synth stabs take over alongside that iconic Bonzai zai zai zai zai vocal. The track breaks suddenly to reveal the 'my style' vocal followed by a slow building synth stab that reaches a sizzling climax before getting back up to full on banging tempo. One for the big festivals here that does not disappoint. Goose's drummer - B, is at the helm for a reworking on the superb Wayfarer by Phrenetic System. Known for his signature electro style B has used some very clever techniques in the studio to get the sound he was after. He has taken the original staccato riff that was the highlight of many sweaty club nights and transformed it into a superb, dirty Techno synth line, all done with mostly hardware synths and a dosing of intuition. The surreal intro lulls you into a euphoric choir like sequence before those great big dirty Techno synths come at you and get right in your face. A solid drum section keeps things moving as B gradually raises the intensity until you can touch the atmosphere. A stand out track that will dominate many floors no doubt. Ghent based duo Asa Moto have opted for something a little different from our back catalogue. They've chosen Cherrymoon Traxs' Plastic Body, Liquid Mind for the contemporary treatment and they've came up with something unique and special. Although a bit too young to have had the full Bonzai experience, Gilles and Olli were excited to join this project and proceeded to familiarise themselves with our back catalogue. Instead of using samples they recreated each melody by ear and then fed it all through to their plethora of equipment in the studio. The remix takes on the melodic attributes of the original in a house music style. The groove here is magical, with a steady swaying tempo you will soon find yourself totally immersed in the warmth and those mesmeric melodies. A solid slice for the house heads. Sue Avenue aka Pieter Santens and Hannes Ledoux were given the task of reworking Blue Alphabet's Genetic Trance with astounding results. The guys admitted to struggling with this one as they usually have a different approach to remixing. With a lack of modern remixing tools such as stems, they resorted to listening to the track to get in the vibe and then isolating the parts they wanted. On the remix you can expect a smooth house groove with warm rhodes and an infectious acid line that lights the track up brilliantly. Tight drums and hypnotic basses tie everything together beautifully making this one an absolute must have.